By 2050, the number of people aged 65 and older will rise to roughly 88.5 million, more than doubling the figure from 2010. As this number grows, so does the interest in how we can age successfully. The study also discovered that roughly $117 billion in annual healthcare expenses can be associated with a lack of physical activity. Dr. Landry’s research highlights that those who practice intentional movement throughout their lives and into later adulthood are less likely to experience severe health conditions often associated with age including high blood pressure, high cholesterol and physical frailty. The Lumin Living platform encourages residents to get moving and keep moving to reduce the risk of injury and illness that comes with inactivity. An active mind reaps huge rewards. For decades, it was widely believed that the process of aging made the brain less flexible, but research proves that neuroplasticity—the brain’s ability to grow, change, and rewire—lasts well into old age. However, neuroplasticity is only as good as the activities that engage it, and research indicates that if you don’t provide your brain with challenges needed to grow and regenerate, you brain function will decline. So, when it comes to cognitive function, you’ve got to use it or lose it. Lumin Living creates intellectual opportunities that challenge residents to think outside the box and learn new skills to increase their cognitive function. Connecting to something bigger than yourself nourishes vitality, and Dr. Landry’s own research indicates this longing to connect is a part of who we are as humans. More importantly, that search is deeply connected to spiritual and overall wellbeing. Part of enhancing spiritual wellbeing is taking the time to experience the present. Instead of focusing on to-do lists and what’s next, taking time to experience life’s little moments can make all the difference in the aging process. Research shows that those with higher quality life experiences are better prepared to manage other areas of their wellbeing as they age. Residents of Revel communities can engage in Lumin Living experiences that focus on spiritual wellbeing, exploring life, and deepening relationships through meaningful connections. Learning how to manage conflict and change keeps stress low and life enjoyment high. Throughout life, taking on too much stress, whether good or bad, can over-activate the immune system. Funny enough, laughter might be the best medicine. Research indicates the ability to remove oneself from the “center of the universe” and focus on helping others to cheer up, or let things go with a laugh can have a profound positive impact on both physical and mental wellbeing. 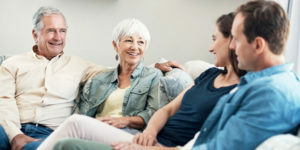 The carefully designed Lumin Living platform offers residents opportunities to connect with themselves and with others in ways that reduce stress, create joy, and increase general happiness. Giving back through volunteering and mentorship helps establishes meaning in life. A 2017 report on community service found that in addition to widespread social benefits, volunteering provides individual health benefits, like lower mortality rates and lower rates of depression in later adulthood. Lumin Living helps residents stay engaged with the community through work and volunteer efforts. Engaging with those around you keeps you open and curious. While being alone has its benefits, like finding time to reconnect with yourself, researchers have found that the need to connect to others is as fundamentally important to our wellbeing as the need for food and water. Aging makes social connections even more important. The stimulation provided by social contact directly correlates with mental and physical wellbeing. Lumin Living explores residents’ social wellbeing and provides opportunities to connect with neighbors, friends, and family in environments that challenge and excite the mind. The data shows that no one area of health and wellness is mutually exclusive. All areas of wellness in aging are impacted by each other, so it’s no surprise that the lifestyle you choose impacts the quality of life that you lead, as proven by Dr. Landry’s research. Lumin Living provides the tools and resources for you to chart your own course toward successful aging for the rest of your life. Dr. Roger Landry will be at Revel Spokane on May 7TH for an empowering conversation about how to maximize your potential later in life. You won’t want to miss this rare opportunity to meet a thought leader on the topic of successful aging.